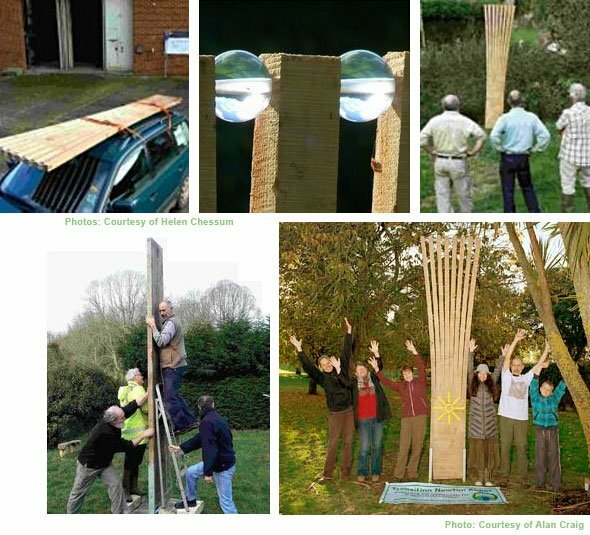 In Newton Abbot in United Kingdom, five tall ‘Energy sculptures’ have been up for six months now, with a sixth on its way, to highlight a debate about energy and how it is at the heart of the economic and environmental challenges facing humanity today. A group of volunteers in a Transition Town group in Newton Abbot wanted to create something tangible and visible around the ideas of energy saving and renewable energy that would spark a discussion in their town. Not always smooth but in the end successful, their journey to raise five three-meter tall sculptures in a number of settings in and around the town started in 2009 and turned out to be “long and interesting”, as it is described in this blog-post on the home page of the Transition Network. The sculptures use wood from a 150 year old cedar tree that needed to come down in the district. They are adorned with symbols representing five sources of renewable energy, which are based on 35,000 year old cave paintings. Energy Sculptures to expand the mind! E=X=P=A=N=D YOUR MIND on ENERGY. Strange but beautiful structures have appeared this week in and around our town. Where are they from? What do they mean? On Monday 7 November, Arcola participated in an exciting discussion about designing out waste in the art and design sector. It was organised by the London Community Resource Network with speakers from TRAID and the East London Furniture Project; it was an exploration of how artists and designers can ensure sustainability in the first place by Designing Out Waste.